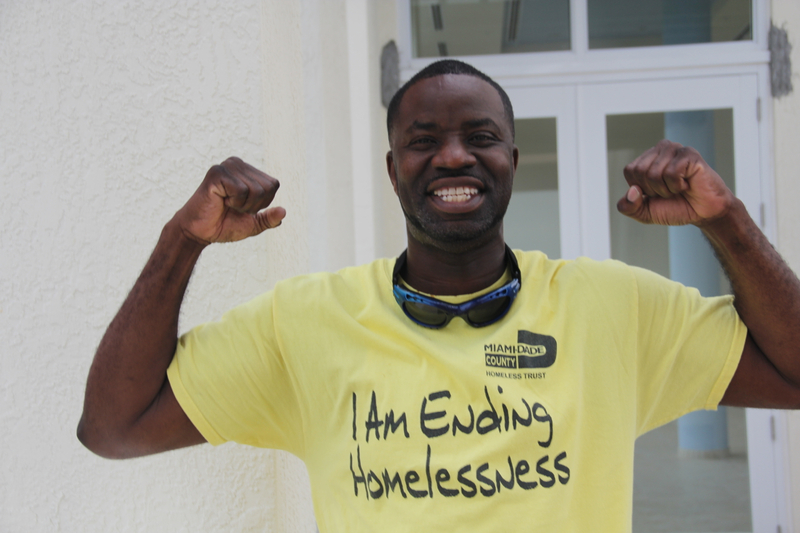 After returning from deployment in Operation Desert Storm, Cedric Halyard found himself struggling with homelessness and addictions. His experience overcoming those challenges has helped him help more than 1,000 other Veterans and their family members who are homeless or at risk of homelessness. As Veteran Outreach Director for Carrfour Supportive Housing’s Operation Sacred Trust program, an initiative funded by a Department of Veterans Affairs Supportive Services for Veteran Families, SSVF, grant, Halyard serves on the frontline of the battle to end homelessness for America’s Veteran families. OST Veteran Outreach Director Cedric Halyard understands firsthand the challenges Veterans face after returning from deployment. His personal experience overcoming homelessness and addictions after returning from Desert Storm has helped him touch the lives of more than 1,000 others. There was no Operation Sacred Trust when I returned from Desert Storm. It was long after my return before I truly understood what I was going through. Like others, I chose what made sense to me to deal with the feelings I was experiencing as I struggled with the transition to civilian life. Before I knew it, I had lost everything, including myself. Now I know it didn’t have to be that way. We can help Veterans transition back into the community and their families in ways that help them protect themselves and their families. No Veteran has to be homeless in America. I’m committed to finding every one of the homeless Veterans in South Florida to help them access the services and resources they’ve earned. When they see how much they’re respected, despite the situations they’ve often gotten into, they are open to learning. The work we do to boost resiliency helps them think more clearly and make better decisions. Our Case Managers then work with each Veteran family to understand their personal situation, resources, and how we can best make sure they never face or experience homelessness again. I know I can’t change the past, but for the thousands of Veterans struggling on the streets of our community or trying to save their homes and families, we can change the future. What is a story serving a Veteran that stands out for you? Every story stands out. What means the most for me is when we can help a Veteran that was feeling hopeless move into a new home or apartment, knowing they have the support they need to make the transition and resources to sustain themselves. I’m proud to have been part of doing that hundreds of times in the past year. It’s especially meaningful to help the female Veterans in our community and the Veterans with young children, so many of whom are single mothers or fathers. It’s not so much the stories that stand out as the images. Images of men and women accepting the keys to their new home. Snapshots forever in my heart of children seeing their room for the first time. And so many memories of people who continue to come back to me asking what they can do to help others now that their own lives are back on track. That’s something that really stands out about our Veterans; how much they continue to want to serve others. What’s your hope for the impact of your work? That no Veteran is homeless in America. That’s a promise President Obama and Secretary [of Veterans Affairs] Shinseki have both made; that we will end homelessness for Veterans. I’m grateful that the VA is providing the resources for us to make that vision a reality for so many of our local Veteran families. There’s enormous work to be done. Like many others, I know we will not rest until the commitment to end homelessness for every Veteran in America has been realized. What’s one of the hardest lessons you’ve learned? I’ve learned that not everyone is ready to take on their lives at any given moment in time. I’ve seen the fear of Veterans not wanting to give up their addictions because they don’t know how they’ll deal with the emotional and physical pain. I’ve seen the fear of many who have experienced so many broken promises that they’re afraid to trust. Helping our Veterans know they’re safe, cared for, respected, and valued is the foundation of helping them help themselves. They have to know that we know they aren’t numbers, but people who have done the best they could to get through the challenges of their lives. Empathy and respect, along with honesty and keeping our promises can make a difference not just for the Veteran today, but for generations to come.